I was dreading the future task of using SurForm rasps to contour pink foam for the layout... the mess, the work, the aching shoulder, the scars on my left hand from the "oops!" Yeah, a belt sander could be used for the coarsest cuts, but real contouring was back to the SurForm. So last weekend I was "imagineering" a power tool, something along the lines of a small hand-held drum sander with the drum sideways for fast but well-controlled contouring. In a perfect world, this tool would also have a provision for connecting a shop vac to deal with the volumes of foam dust this device would generate. Notice the vacuum hose connected to the handle! Not totally dust-free, but darned close! Very impressive. How did you get turned on to that rig? And where did you get it? Had the idea, and did an online search... 'hand-held drum sander' or something like that. I fished through a few of the results and found a couple that mentioned a type I'd never heard of, "surfacing sanders", and there it was. Got it at the local Lowe's, $100. Home Depot has it, too. Great idea and nice find! Holy *****. One of those is definitely going to come live with me before my next layout is started. Thanks, Ed. I kinda thought you'd appreciate it. Keep an eye on the GC&W thread, I'm about to carve a mountain with it. Not totally dust-free, but darned close! I just use a wire wheel in a drill. Not to be the grumpy contrarian, but I still haven't seen anything to beat a hot wire tool. Clean and precise, with the ability to create shapes (such as undercuts) impossible with any other tool. 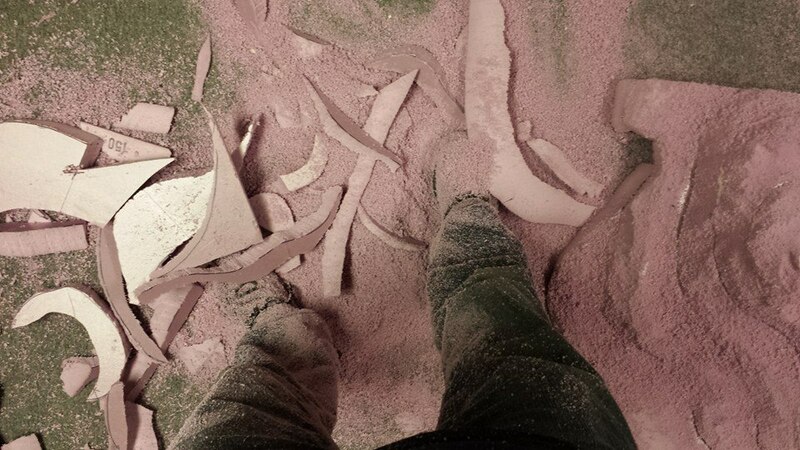 Mike, are you using the sanding drum or the paddle grinder? Drum. I was using the coarsest sleeve (60 grit) in the demo clip, but have since discovered it "grabbed" too easily with concave cuts. I'm using the finest sleeve now (120 grit), which oddly enough cuts the foam at the same rate as coarse.